I found this beauty on EBay last fall. It is unique and a blast to ride! Pack that bad boy up and head south....I can already feel the sidecar calling my name!! !...too very cool! Lee...will have to get a copy of Carla's book. I will be retiring in a few years and can't think of a better way to spend those days. Pack up the sidecar and disappear ... :) I did several solo long hauls on my Shadow VLX in the past and they were the most memorable times of my life. The cleansing solitude and people you meet, on the road, can only be appreciated by fellow bikers. No matter what kind of mood I'm in, I can't help but break out in a wide grin as soon as I pull out of my driveway! Love My Sidecar Hack Too! I have a Ural Sahara and love mine too! I am planning a trip across America this year on her and can't wait! I love the vintage look of yours and in general what the sidecars bring to the look and motorcycle world. They are a blast to ride and great way to travel about town. Enjoy! 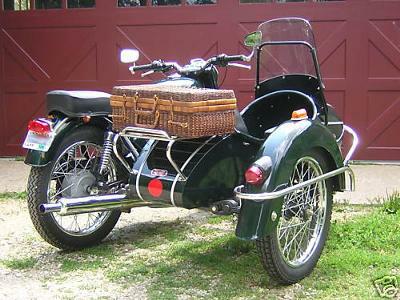 I have a Ural Sidecar Tourist 05. I found mine on Craigslist. The former owner took very good care of it. I am having so much fun riding my Ural. One nice thing about these motorcycles is you can go off road Traveling is great as there is so much room to put your stuff in. I have a truck and put a lock on it. The Royal Enfield are really great. There is an 85 year old lady that is riding one in Idaho somewhere. Gorgeous rig! Looks like it's just waiting to go on an adventurous picnic! Just finished reading a book by Carla King, "American Borders". Carla rides a Russian Ural with side car all around the U.S. Border into Canada and Mexico. Reading about her solo trip is very entertaining. But I'm sure your Royal would be more fun to ride! What a find! Have a double blast!! What a gorgeous, gorgeous outfit.